The Topeka Midland line of 16 oz Latte cups are white coffee mugs with a color accent halo and base to match. These two toned ceramic coffee cups have a large and sleek body making these mugs a favorite for many coffee lovers. 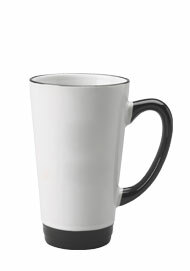 Topeka Latte Mugs minimize the possibility of mixing your coffee mug up with someone elses because of its distinct design that is taller than the average coffee mug and its high arced handle. These latte mugs are typically found at classy coffee houses and restaurants.